As you may know, I'm very excited about this years Toronto Men's and Women's Fashion Weeks because my brother and I are ambassadors for the event. The day was extremely fun, the shows are taking place at 1 Younge St. in Toronto, and feature the longest runway. The designers that showed on the first day, were more focused on street style fashion, and we got to JMTrends, Helmer, Xian, Kollar, and my personal favourite, Hip and Bone. For my outfit (which was mildly inspired by Mindy Kailing), I wore a neon yellow trench from Banana Republic. I thought it was a little bit fun, and the fact that it was both rain resistant, and an actual coat, meant that it was very practical too. 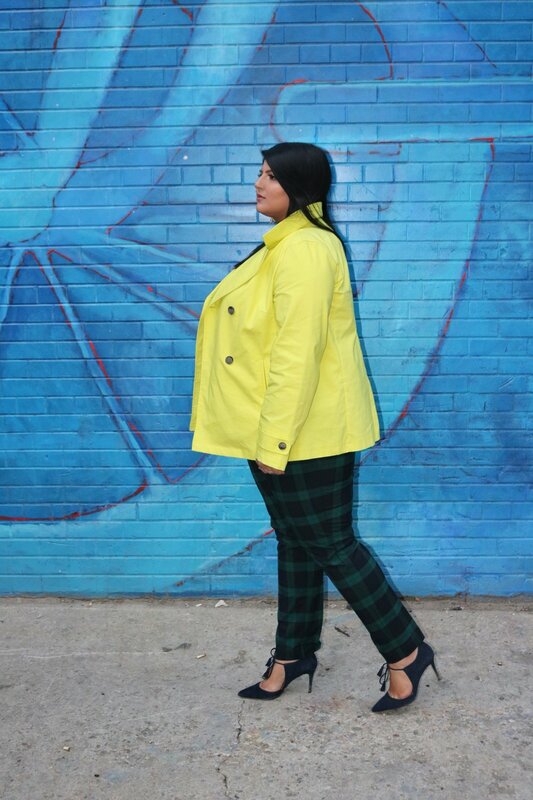 I paired the coat with a pair of green, and dark blue, plaid pants. I love that the pants are strangely complimentary to the the blazer, but add a little something extra to the look. The shoes I chose are a pair of Mary-Jane style suede booty heels, with a tassel tie up at the front. I had bought these from Ann Taylor last year, and loved how they looked. These shoes are however, painful to wear, and after about an hour, I had lost the feeling in two of my toes.